This is a great event for meeting local artists in the relaxed atmosphere of TUPPS Brewery and find unique holiday gifts you won’t find anywhere else. More than 40 artisans will be on hand including potters, painters, jewelers, woodworkers, sculptors and more. The McKinney Creative Community is a network of local artists who share a desire to keep McKinney creative. Please come out to shop, taste and show your support. 20apr11:00 am10:00 pmSaturday at TUPPSFood trucks? Music? Special Events? Take a look! 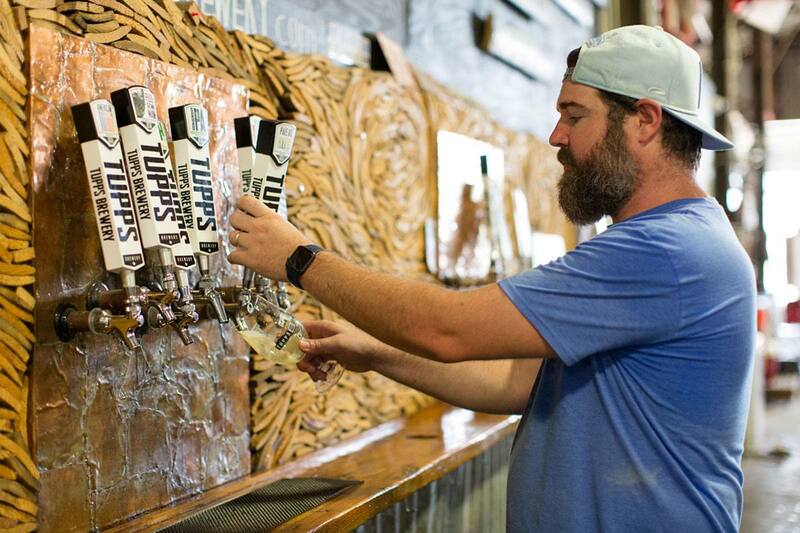 Food: Pit Pals BBQ 1PM-8PM Free Brewery Tour: 12:30PM Live Music: Wyatt and the Harbingers from 1-4PM and BJ Stricker & the Kings Concert 7-10PM (no cover) Beer on tap: https://tuppsbrewery.com/beer-on-tap/ Family-friendly! Spring is here! Since the weather is oh so nice, we decided to start a once a month concert series! Once a month you can expect a live, talented, unbelievable band! This Saturday night LIVE at TUPPS BJ Stricker & the Kings from 7-10PM. The best part? NO cover charge. Want to snag dinner while you are there? Pit Pals BBQ will be out from 1PM-8PM. Growing up in the middle of nowhere, Northern Wisconsin where lumberjacks roam was the woodsy childhood of singer-songwriter BJ Stricker. Part of the last generation that actually played in the mud, Stricker’s upbringing centered around bikes, 4-wheelers & going up the road to get cookies from grandma while listening to music on grandpa’s record player. Music has always been a release, first being able to express himself through a bass guitar at 12 years old. He learned his musical bearings in 6th grade pep band, finding himself in his first four-piece band as a 15 year-old freshman in high school. By 17 years old, he got his first six-string and wrote his first song during his first semester of college in a dorm room with his best friend. After college in Wisconsin, he bounced around quite a bit, living in Montana, New York, and North Dakota. In 2014 he moved to Texas, briefly visiting New Orleans to immerse himself in the vivacious live music scene there. Energized with his passion for music, Stricker recorded his first EP Middle of the City in 2015. It was his first experience collaborating on original music with other musicians, including saxophonist Keith Anderson – who at the time was playing for Prince. In June 2015 he met drummer Connor Pickle, and began writing songs with him. By February 2016, they had put together a five-piece band – giving Stricker the opportunity to cut his teeth booking his first shows. In early 2017 the band’s lineup included Ryan Dahir (sax), David Wilson (guitar) and Patrick Smith (bass); later on Luke Callaway would be a new addition, taking over drums from Pickle. After grooving with chemistry and playing just two shows together, they decided to record an album. Driven by Stricker with a big & inviting folk rock-style acoustic sound, the full band brings warm accompaniment on electric guitar & saxophone with playful melodies influenced by the style of Dave Matthews, Neil Young and Amos Lee that gives their music a hint of blues and soul. The band released their 6-track record Roam as BJ Stricker & The Kings in November 2017, featuring an intimate listening party in Dallas. Currently the band is represented by 13th Floor Music and has been showcased this past year in Dallas-based festivals Cottonwood Arts Festival, Whistlestop Music Festival, and Deep Ellum Brewing’s Labor of Love. The group recently released a live-recorded EP at The Rustic featuring two previously unreleased songs, with plans to produce another live album in 2019 with more new music. Open on Easter from 1-5PM! The taproom will be open on Easter Sunday from 1PM-5PM. Happy Easter! 24apr5:30 pm8:30 pmWednesday Night Crit RacesCOME AND RACE IT OR WATCH IT! Every Wednesday night until September, we are hosting weekly Wednesday night CRIT RACES! Come on out and ride the course or watch the madness take place. Want to come watch? No cover charge. Cold beer waiting for you. Wednesday Night Crits is sanctioned by USA Cycling Permit #2019-1167. USA Cycling license is required. Annual and one-day licenses available on site. All USA Cycling rules are in effect. Entry Fee is $20.00 for Adults, $10.00 for Juniors (18 & under). No additional fees for multiple race registrations per night. Cash and credit cards accepted on site. Juniors are ages 10-18 as of December 31, 2019. Race start time and course length may be adjusted as necessary. Course features supplemental lighting for night racing. Men & women will race together and be scored separately. Prizes for top 5 finishers (men & women). Prizes may include cash, merchandise or awards. Chip timing will be utilized. Timing chips are available for rent ($5.00 per night) or purchase ($65.00). Timing chips are compatible with Tuesday Night Crits (Richardson) and Thursday Night Crits (Fair Park). 26apr7:00 pm10:00 pmFriday Night Live Music: Chris RaspanteLive Music and Food Truck Friday! Spend your Friday night listening to live music by Chris Raspante. No cover charge. Raspante’s musical style will remind you of the Black Keys, White Stripes, Stevie Ray Vaughn, and Wilco. A native of North Texas who cut his teeth playing in DFW in the 90s, Raspante returned to the Lone Star State in August when his wife (after earning her Ph.D in Nashville) was offered her dream job in Dallas. Raspante has worked with a wide range of well-known artists including The Dixie Chicks, Travis Tritt, Steve Lukather from Toto, Stan Lynch from Tom Petty, Thompson Square, Radney Foster, Collin Raye, Jamie O’Neal, Ty Herndon, Billy Dean, Tammy Cochran, Jace Everett, as well as for producers like Dann Huff, James Stroud, David Z., Mark Wright, Greg Droman, and many Nashville songwriters. In addition to Junior Brown, Matthews has played drums with the Dixie Chicks, DeRailers, and Dale Watson. 27apr11:00 am10:00 pmTUPPS Four Year Anniversary PartyLive music, over 25 beers, delicious food and CAKE! Has it really been 4 years already? That’s right, we’re celebrating our 4 year anniversary on Saturday, April 27. In the last 4 years, a lot has happened since then like increasing the size of our brewing facility (a few times), creating and releasing incredible beers, and expanding our distribution. The most important part in all of this is YOU; our fans, friends, and family. We couldn’t think of a better way to celebrate all the good beers and good times than to throw a big party! So, we sure everyone makes it out to celebrate with us in true TUPPS fashion. We’ll be tapping rare beers, roasting hogs, rocking out to all your favorite local bands, and enjoying a craft beer extravaganza! Oh! and cake. There will be cake. Rye, a local restaurant in McKinney, will be out roasting two whole hogs cooked over open wood flames on our spit served with a TUPPS BBQ sauce and smoked gouda mac and cheese. Drink Card for 12 pours (4 ounces per pour) Extra sample cards available for purchase. Drink Card for 12 pours (4 ounces per pour). Extra sample cards available for purchase. Below you will find the list of all the beers that will be on tap for our FOUR YEAR Anniversary. The beers with LIMITED at the end of their name will go quickly. With your purchase of a tasting card, you will get to try 12 beers at 4 ounces per taste. You may purchase additional tasting cards the day of the event. LIMITED beers will be tapped first for VIPs from 11am-12:30pm. General Admission will begin at 12:30pm. ==> We are launching a line of IPAs that will have pure essential oils made from fresh hops, steam-distilled right out of the field at harvest season. This captures the intense, aromatic essential oils found in only fresh hops. So how exactly does the process work? ==> It starts with fresh hops during harvest season. Then, they steam-distill the whole hops with pure steam. Instead of removing the leaves and steams (which removes so much flavor), they keep the whole hop intact through the steaming process. After steaming the whole hops, they collect the vapor, cool it, distill it, then separate the pure hop oil from the water. The hop oil is purified for use, then we go in and add the hop oils after fermentation. The taste is truly as fresh as you can get! It’s a new process we are really excited about and want you to come out, try our new line and tell us what you think! Depends on the ticket you have. VIP tickets can access at 11 AM. General Admission is at 12:30 PM. Have your ID and ticket (paper print out or on your phone) ready. There will be plenty of beer to go around, regardless of ticket type. Good times all day! Will you be selling tickets at the door like last year? Yes, we are offering tickets at the door. You must be at least 21 years to drink, and show a valid ID. You will be wrist-banded and must show this wristband while at the event. However, children accompanied by a parent can enter. Do non-drinkers and children have to have a ticket? No, non-drinkers and children do not have to pay to enter. We have free parking around the large field across the street. However, if you’d like to take public transportation, you have some great options. And, we’re big supporters of UBER & LYFT. Please do not drink and drive. All the obvious stuff. Just don’t be stupid, please. Definitely no weapons, drugs or other alcohol products. Nothing that ruins other people’s good times. We don’t want the negative vibe of having to have a cop throw you out. Nobody wants to be that guy. You can also bring folding chairs to ensure you have a seat! Having your ticket pulled up on your phone is the easiest and greenest option. Tickets are great, especially for back-up purposes. We also have an order list at the desk. Either way, having your ticket on your phone will ensure everyone gets in as quickly as humanly possible! Depends. We’ve seen all the tricks. But seriously, that’s cool as long as the purchaser name lines up on our records. Having your ticket or confirmation on your phone is highly recommended. Unfortunately, the City of McKinney does not allowed us to have dogs on premise at this time. We wish! How do the beer samples work? VIP and General Admission ticket fees gets you a sample card for 12 samples. Each sample is roughly 4 ounces. If you are drinking responsibly, extra sample cards can be purchased. Highly recommended! Definitely eat while you are here sampling beer. We will have food catered by Rye, a local Mckinney restaurant, who will be roasting 2 whole hogs for us as well as providing all of the sides you could ever want. Save your appetite for these guys and some cake! Happy Piggy & Bunny Yoga-For Charity at Tupps Brewery. Featuring and benefiting Awwdoptable Pet Rescue! Exercise, animals & positive people are all recommended to relieve stress, anxiety, depression or just put a smile on your face. We’ll have them all! The perfect cure for a chaotic week. Enjoy a happy-vibes yoga class in a relaxing atmosphere while adorable piggies and bunnies oink and hop all around you! It’s your good mood boosting “therapy” and cuteness overload to melt away life’s negativity!! Plus, stick around and enjoy a FREE beer from Tupps Brewery! (1 per person) This special session is benefiting Awwdoptable Pet Rescue (scroll down to learn more). ~First hour= An all level piggy and bunny yoga class taught by one of our amazing instructors. ~Bring a yoga mat and towel. ~Class is outdoors, dress appropriately for the weather. ~Good for all levels – Beginner friendly (even people who say they don’t like yoga, love this class). About the charity: Awwdoptable, Inc. is a recognized rescue partner of the following Texas-based municipal animal shelters, Dallas Animal Services and Adoption Center, Mesquite City Animal Shelter, Garland Animal Services, Lamar County Humane Association, Longview Animal Care and Adoption Center, and City of Laredo Animal Care Facility. We work to secure, rehabilitate, & rehome companion animals of the greater Dallas/ Ft. Worth communities. We are a recognized 501-c-3 tax-exempt rescue that was established in October of 2016. Rest assured, these cute bunnies and piggies live on a family farm and are taken care of, loved & certified for mingling with the public. Check out www.HappyGoatYoga.eventbrite.com and www.itsforcharityevents.eventbrite.com for all programs, dates and fun locations.